We can now offer Sips Panels in your building design. 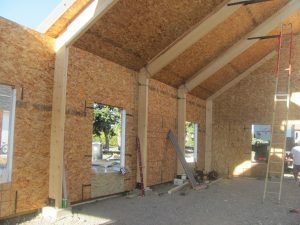 Structural insulated panels (SIPs) are a high performance building system for residential and light commercial construction. The panels consist of an insulating foam core sandwiched between two structural facings, typically oriented strand board (OSB). SIPs are manufactured under factory controlled conditions and can be fabricated to fit nearly any building design and eliminates the need for any other insulation .The panels can be used for all aspects of a build, whether it be the roof, external or internal walls, even the flooring. The result is a building system that is extremely strong, energy efficient and cost effective. Building with SIPs will save you time, money and labour.